The United States Mission in Brazil strives to provide the most rapid, efficient and fair visa application process possible. Visa applicants from all regions in Brazil are treated with equal respect and given equal consideration in the visa process. are the same for the Consulates in Rio de Janeiro, São Paulo, Recife and the Embassy in Brasilia. The Consulate will always be closed on Brazilian and American holidays. The Consular Affairs Section will be occasionally closed for administrative purposes. Please click on the link above to learn the dates. For security reasons, visa applicants and American citizens are not allowed to enter the Consulates or the Embassy grounds with bags (with the exception of one small purse), cell phones or any other electronic devices. The Consulates and the Embassy will not be responsible for any lost or damaged personal items exceptionally left with the Consulate’s local guard detachment. Neither the Consulates nor the Embassy have appropriate storage facilities. The U.S. Commercial Service mission in Rio de Janeiro and throughout Brazil is to promote the export of goods and services of American companies and develop and protect U.S. business interests in Brazil. We have a vast network at our fingertips, supported by more than 1500 international industry and trade specialists whose job it is to provide the best source of customized solutions for US companies (and their Brazilian partners!) to do business in the global marketplace. Whether you’re a U.S. businessperson looking for an export opportunity, or a Brazilian business solution provider looking for a new source of supply, you’ve come to the right place: New business is waiting for you! Please take a moment and visit our website and familiarize yourself with the variety of opportunities, tailored programs, and customized services available to you through the Commercial Service Rio de Janeiro and Brazil. We also encourage you to contact a U.S.-based Export Assistance Center, where trade specialists will provide you with guidance on entering Brazil and other exciting international markets. Please call 1-800-USA-TRADE or check the U.S. Commercial Service web site to locate the office nearest you. If you are a US company that is interested in doing business in Brazil, or a Brazilian company&nbsp;that is interested in sourcing American products or services, you’ve come to the right place. We are here to help you! Note: This office is open for commercial services only. For visa information please contact the Applicant Service Center in Belo Horizonte. Site: http://brazil.usvisa-info.com. Phone: (55 – 31) 3958-0556. The only US military representative serving in the US Consulate, Rio de Janeiro. Performs representational duties at ceremonies, graduations and receptions. Servers as the primary POC for hosting military visitors. Acts as advisor to Ambassador and CG on military issues. Supports US Navy and NATO port calls to Rio by coordinating with husbanding agent and force protection officers. Coordinates diplomatic functions like tours, receptions, and community relations projects. The U.S. Patent and Trademark Office (USPTO) is an agency of the Department of Commerce, headquartered in Alexandria, Virginia. The USPTO advises the President of the United States, the Secretary of Commerce, and U.S. Government agencies on intellectual property (IP) policy, protection, and enforcement; and promotes the stronger and more effective IP protection around the world. The USPTO furthers effective IP protection for U.S. innovators and entrepreneurs worldwide by working with other agencies to secure strong IP provisions in free trade and other international agreements. It also provides training, education, and capacity building programs designed to foster respect for IP and encourage the development of strong IP enforcement regimes by U.S. trading partners. In 2006, in partnership with the International Trade Administration/U.S. and Foreign Commercial Service (ITA/US&FCS), the USPTO created the Intellectual Property Intellectual Property Rights (IPR) Attaché Program, which places IPR experts at select US Missions in order to promote high standards of IP protection and enforcement abroad. IPR Attaché offices are located in the following countries: Belgium, Brazil, China, India, Kuwait, Mexico, Peru, Russia, Thailand, Switzerland, and the Ukraine. The United States Mission in Brazil is working to guarantee protection of Intellectual Property Rights (IPR) through promoting enforcement, adoption of policies which encourage innovation, and public awareness of the importance of intellectual property rights. We work closely with law enforcement authorities, the Brazilian National Council Against Piracy, private sector groups and other interested parties to protect the rights of innovators and consumers. Copyright laws encourage the creation of literary works, computer programs, artistic works, and expressions of national culture. Patent laws encourage the discovery and development of new and improved products and processes, while promoting public disclosure of information regarding those new products and processes. Trademark laws encourage the development and maintenance of high-quality products and services, and help companies promote customer loyalty. There are other types of IPR laws as well, such as trade secrets, industrial designs, and others. Promoting and protecting intellectual property is in every country’s national interest. Intellectual Property (IP) is a vehicle for the creation, dissemination, and management of knowledge, and protecting IP allows countries to protect their intellectual assets. Intellectual property rights are the universal currency of today’s global innovation economy. Effective protection and enforcement of intellectual property rights is essential for economic growth in the developing world. Protecting IPR stimulates innovation. It rewards creators and encourages the development of more efficient methods of production and distribution. It invites the introduction of new products, quality brands, technology and services, and stimulates new domestic markets by improving existing products and technology. Policies that protect intellectual property help to ensure a diverse and competitive marketplace. The Library of Congress Office, Rio de Janeiro, Brazil, is one of six overseas offices administered by the African/Asian Acquisitions and Overseas Operations Division of the Library. These offices acquire, catalog, preserve and distribute library and research materials from countries where such materials are essentially unavailable through conventional acquisitions methods. The office in Rio de Janeiro collects materials from the South American countries of Brazil, Uruguay, Suriname, Guyana and the French overseas Department of Guiana. The office´s mission is to enrich the research collections of the Library of Congress with the wealth of bibliographic production from these countries. The Rio de Janeiro office opened its doors in 1966 as a National Program for Acquisitions and Cataloging office serving the Library of Congress for Brazilian publications. Responsibility for Uruguay was added in 1986, a cooperative program for serials was initiated in 1990, and coverage for Suriname, Guyana and French Guiana was added in 1997. Publications acquired include books, newspapers, journals, pamphlets, cordel literature, compact discs, maps, posters, musical scores and more. Many publications are purchased by the office, but slightly more than one-half are acquired via exchange from approximately 600 exchange partners. In 1990, the Library of Congress established the Cooperative Acquisitions Program in the Rio Office to acquire Brazilian serials for participating libraries. This Brazil-based service offers subscriptions and claiming services for some 265 serial titles – scholarly journals, newspapers and magazines – in the areas of political science, social sciences, language, literature, business administration, education, science, history, culture and law. Journals offered in the program are carefully selected. Among the criteria used are research value, availability, reliability and timeless. For a complete listing of journals available refer to the subsection “Serials Available” under the “Rio de Janeiro Lists” section of the website. In 1998, the office begin offering a selection of music compact discs. Types of music covered include popular Brazilian music, folk (Indian, caipira, etc.) and classical. For a set price LC/Rio will ship a selection of 10 to 45 Cds once per year. The Rio Office has actively collected pamphlets, serials and posters issued by a variety of Brazilian organizations and groups for microfilming. This selective collection renders accessible a abody of primary materials, mostly non-commercially produced and difficult to acquire, which is fundamental to the study of grassroots political and social movements in Brazil. The documentation includes newsletters, house organs, reports, collections of clippings, brochures, resolutions of congreses, educational manuals, independent news services, catalogs of publications and handouts. Geographically, all regions of Brazil are represented in the collection. Brazil´s Popular Groups: 1966-1986 was conceived as a means of documenting popular movements that came with the end of Brazilian military rule and the inauguration of Brazil´s New Republic in 1985. The 20 year retrospective collection is followed by supplements for 1987-1989, 1990-1992 and annually thereafter. The Library´s mission is to make its resources available and useful to the Congress and the American people and to sustain and preserve a universal collection of knowledge and creativity for future generations. The exchange program has been an integral facet of the acquisitions operations since the opening of the office. The program is vital to the inflow of new materials and ensures receipt of materials that may not otherwise be acquired. Currently there are exchange agreements with more than 500 Brazilian, Uruguayan, Surinamese, and Guyanese research institutions, government agencies, universities and public libraries. The Rio Office compiles bi-monthly exchange lists of materials offered including duplicate or out-of scope materials, reference books, Braziliana, magazines and selected Spanish-language titles and circulates the lists to exchange partners. The exchange is maintained on a piedce-per-piece basis and a balance of trade is kept with each institution. The Political Section is responsible for analysis and reporting to the United States Government on the official positions of the Brazilian Government on international political matters as well as on political developments in Brazil as they unfold, such as elections, significant pending legislation, etc. Additionally, the Political Section compiles information for the State Department’s annual reports on human rights, religious freedom and trafficking in persons. Together with the Public Affairs Section, the Political Section works with the Brazilian Government, other U.S. Government agencies, and the U.S. and Brazilian private sectors and civil society to implement the U.S.-Brazil Joint Action Plan to Eliminate Racial and Ethnic Discrimination and Promote Equality and the U.S.-Brazil Memorandum of Understanding for the Advancement of Women. The Economic Section, works with other United States government agencies including the U.S. Commercial Service, Foreign Agricultural Service, Treasury Department, USAID, Federal Aviation Authority, and others, as well as with our consulates in Sao Paulo, Rio de Janeiro, and Recife to seek opportunities to deepen investment and trade ties with Brazil bilaterally in order to increase business opportunities, job growth, and economic development. We are building partnerships with Brazil to promote global economic and social inclusion goals, including addressing the global financial crisis, food security issues, trade liberalization/cooperation, and economic development cooperation. The Public Affairs Section explains and advocates American policy and works to promote mutual understanding between Brazilian and American societies. 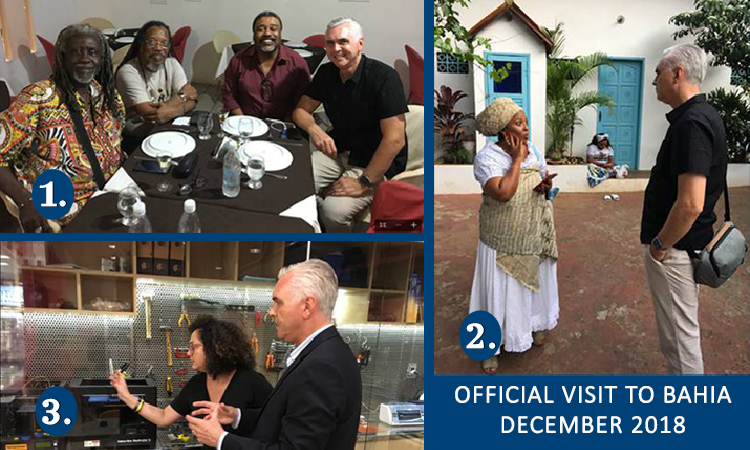 The Public Affairs Section acts as a focal point for media, think tanks, and academic and cultural institutions, and advises the Embassy on public diplomacy issues. The Section’s two offices, the Press and Information Office and the Culture and Education Office, together with the Information Resource Center (IRC), are directed by the Mission’s Public Affairs Officer. They work together to strengthen the Brazilian-American relationship. The Culture and Education Office is headed by the Cultural Affairs Officer. 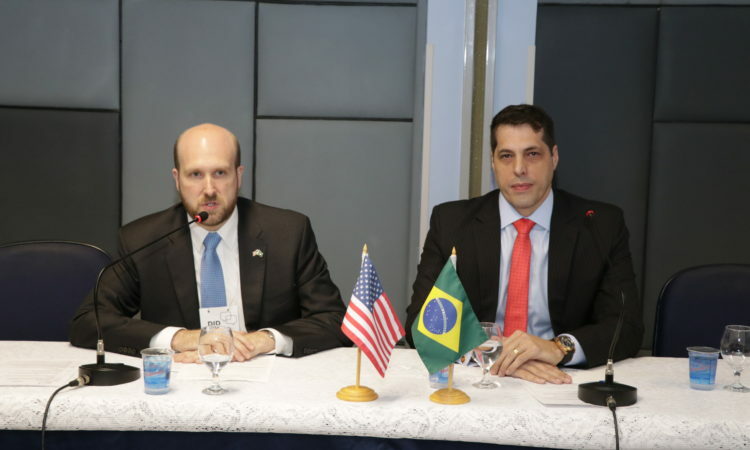 The Office provides Brazilian audiences with an understanding of U.S. foreign policy and its context through seminars, conferences, and American speakers. The Press and Information Office is headed by the Press Officer for the U.S. Consulate in Rio de Janeiro. It explains and supports American foreign policy and promotes U.S. national interests through a wide range of information programs directed at Brazilian media. More specifically, the Press Office aims to provide authoritative information on U.S. government policies to Brazilian media and to track — and report to Washington — media opinion on a range of issues important to the United States. prepares and distributes speeches, policy, statements, press releases and special publications on issues important to Brazil and U.S.- Brazillian relations. Journalists desiring information about U.S. policy may contact the Press Attache at the Consulate. The Environment, Science & Technology, and Health (ESTH) Section supports the goals of the many U.S. Government departments and agencies in the following areas: environment, especially with respect to climate change and combating deforestation and earth observation; science and technology, from cooperation in space activities to promoting stronger ties between the U.S. and Brazilian scientific communities; and health, both with respect to addressing tropical diseases and worldwide threats. A wide variety of treaties, agreements, memorandums of understanding, and implementing arrangements provide an institutional foundation for extensive cooperation in the ESTH areas. Further, bilateral consultative mechanisms such as the Joint Commission Meetings on Science and Technology and the Common Agenda for the Environment provide opportunities to review and strengthen links between the two countries. Illegal Trafficking of Plants and Animals from Brazil to the United States. The United States is a major consumer country of plants and animals that have been illegally obtained in other countries. Brazil, with it rich abundance of wildlife, is sometimes a supplier country. The illegal trafficking of plants and animals may violate the international regime to protect species endangered of extinction, under the Convention against International Trafficking in Endangered Species of Wild Fauna and Flora (CITES), and may constitute a crime under U.S. domestic legislation. The ESTH Section is interested in information about such illegal trafficking to the United States in animals and plants, including timber illegally harvested, and can help to direct such information to the appropriate law enforcement authorities.